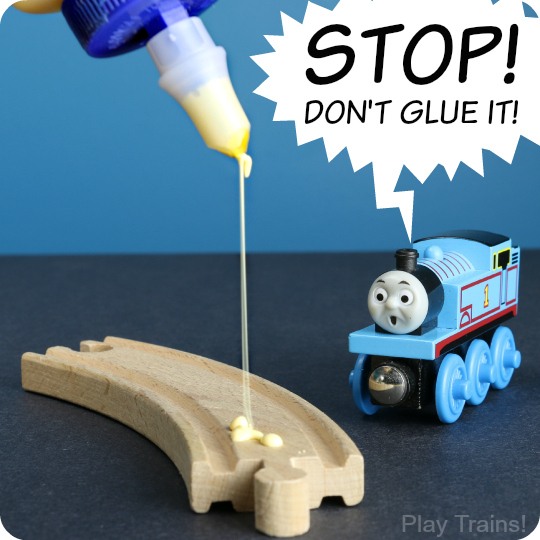 I have this theory that trains can be used to teach any subject. This seems especially true for math. 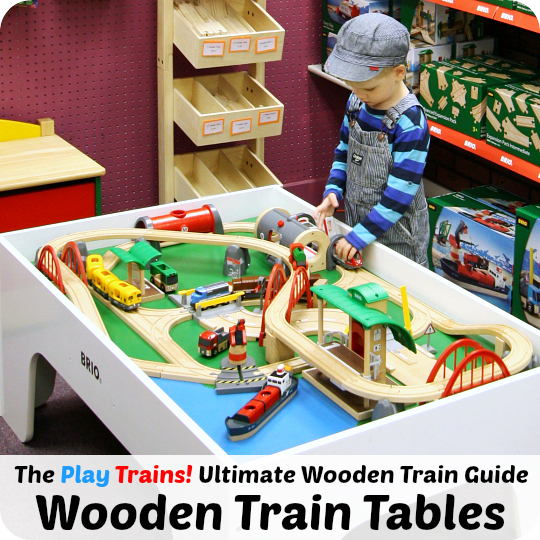 I keep thinking up new train math games myself, finding new commercial train games with a math element, and running into new ideas online. He really has been shouting that for a year now. Not non-stop, thank goodness, but we keep coming back to Dice Cars. I think there are two main reasons for this. 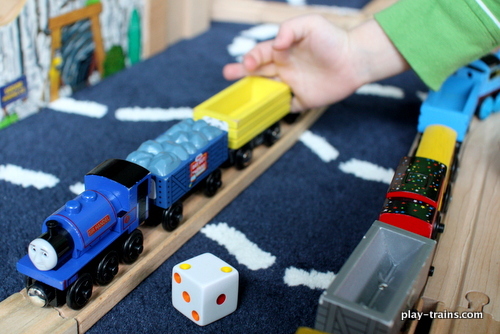 First, the game involves a lot of the same things he loves to do when he’s just playing trains normally: coupling and uncoupling cars from an engine, loading and unloading freight, and driving his train around the track. 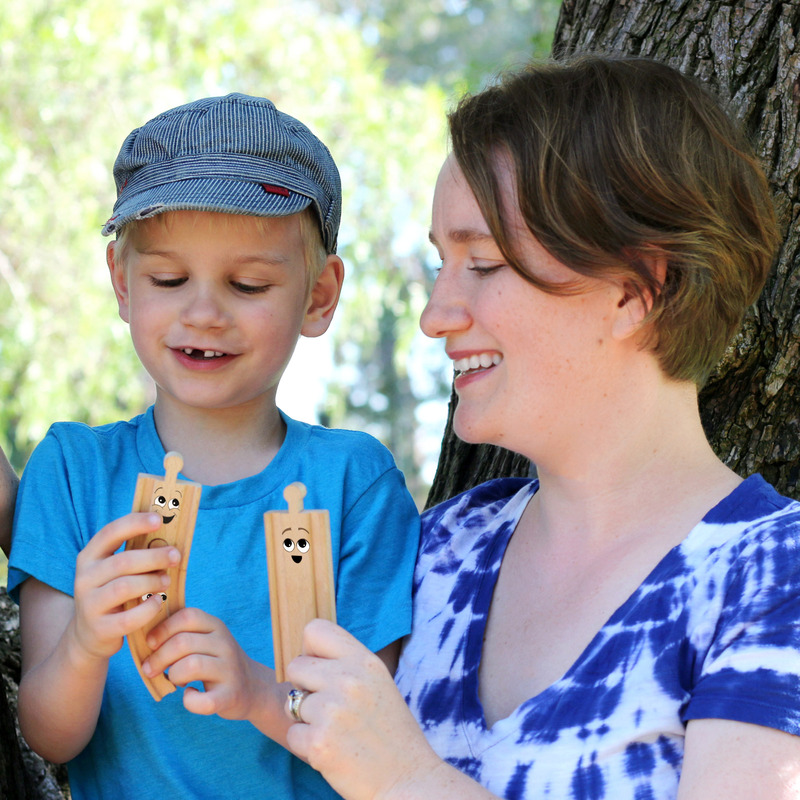 The dice themselves add an appealing tactile, aural, and visual element as well. 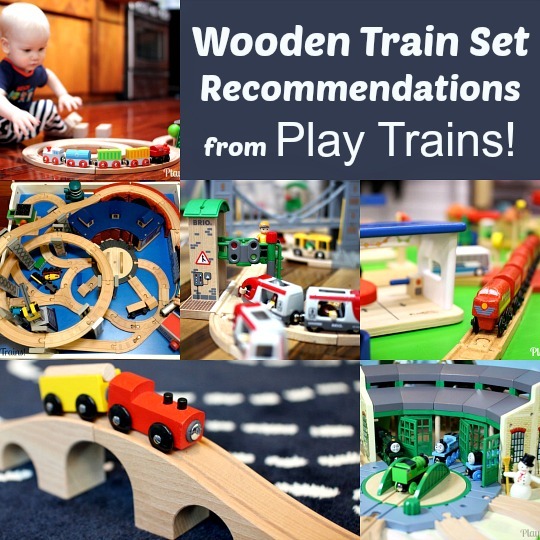 They make excellent freight, and his latest thing he likes to do on his own is lining them up in a row at the side of the track, sorted by size and type, and counting them. We especially love the large, white dice with multicolored dots we found at a local toy store; they’re easy for a beginner to read and cheerful. Meekat can even hold the dice and “roll” them on his turn, which adds to the fun. On your turn, you roll the die, and couple up your engine to that number of cars. 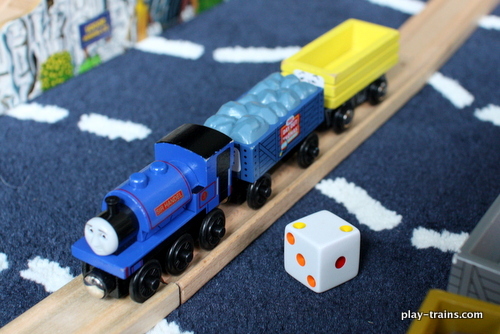 Here, Meekat rolled a three, and attached three freight cars to Sir Handel. 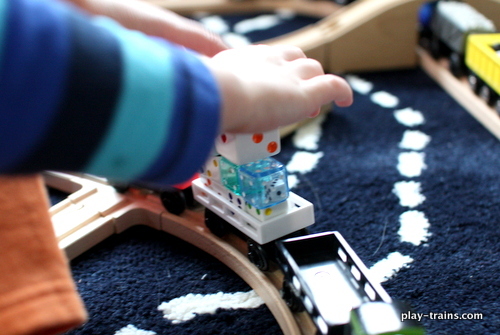 On his turn, the Little Engineer rolled a five, so Thomas is now pulling five freight cars. Back to Meekat again, and he rolled a two. 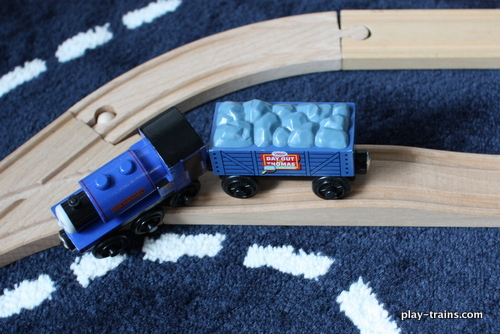 The Little Engineer helped his friend uncouple one of the cars (Meekat thinks it’s pretty awesome having a best friend with opposable thumbs), and now Sir Handel is pulling two cars. At first, we played it in that simple way. Once the Little Engineer and Meekat were good at identifying the numbers on the dice, we started talking about how many more or less the new amount was, counting the cars we were leaving behind, that sort of thing. 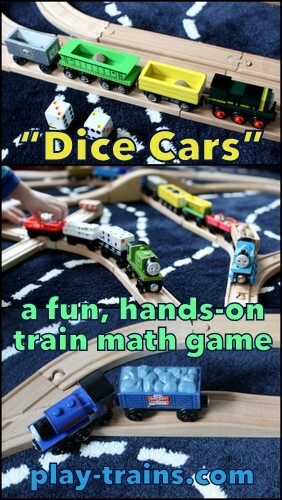 The trick here is to talk about the math concepts in a “train yard” sort of way — that’s why I play Dice Cars as Meekat, and not as myself. 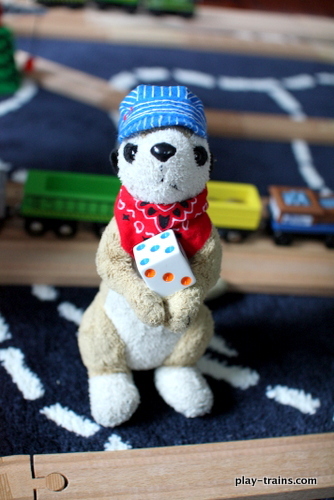 He makes the number talk sound like…well, like an overly-enthusiastic, train-loving meerkat’s idea of what real railroad workers would say in a freight yard. If I talk about it, it sounds more like a math lesson. Both the Little Engineer and I prefer Meekat’s version. Before I get to some of the slightly more advanced forms of the game that the Little Engineer is starting to be interested in, we should talk about the excitement factor. 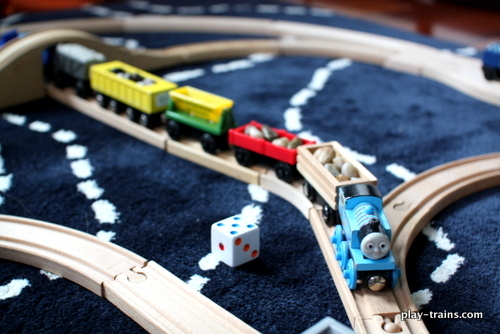 One thing we enjoy doing is simply chuffing the trains around the track after each turn, or using battery-operated engines and turning them on for a moment before stopping them and rolling again. It keeps the activity from seeming too forced by breaking up the thinking parts. 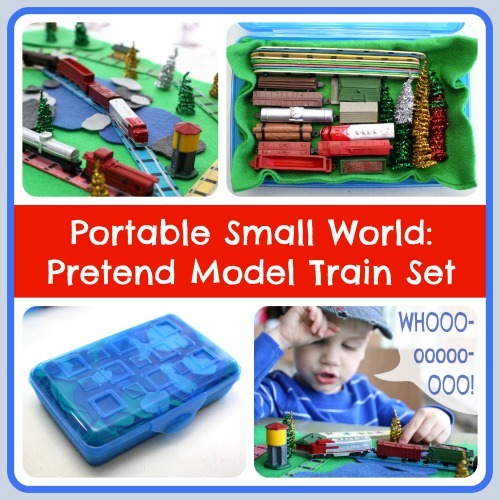 The Little Engineer now usually goes for full-on pretend play and brings his engines back to the freight yard or the docks to play with a bit before rolling his die again. For additional excitement — and the possibility to extend the discussion into the realm of physics — start each turn at the top of a slope, preferably a very high one, with a length of straight track at the bottom. 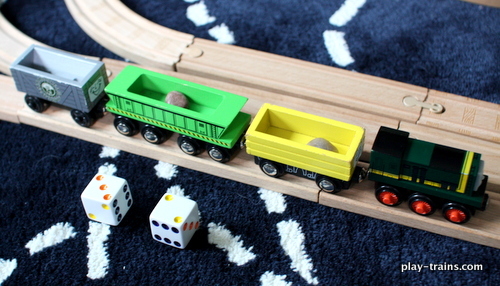 Roll your die, attach your cars, and make predictions on whether or not your engine will make it down the mountain without derailing or crashing. The fun thing about this is the result changes depending on which engine you use, which and how many freight cars are coupled up, whether or not they’re loaded with freight, and how straight your slope and the track beyond it are. 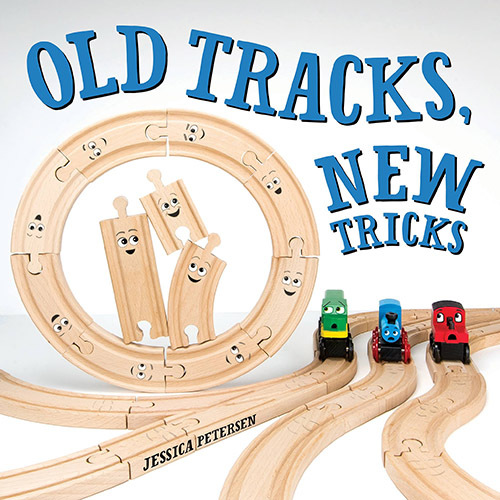 Some engines are so light that they need several cars behind them to stay upright on a somewhat crooked track, and some engines and cars are so solid and heavy they have too much speed to slow down before the inevitable turn at the edge of the layout. Derailed! 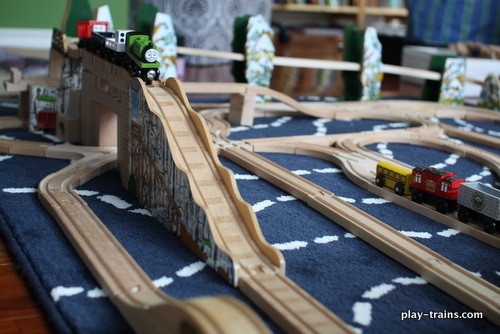 I was hoping for a more spectacular crash to photograph, but we were playing a collapsing block bridge game at the top of the mountain, and we didn’t get too many chances to send our trains down between bridge rebuilding sessions. Okay, back to math. Once your engineer has the one-die versions down, you can try one with two dice. Here are two that I’ve thought of, and I’m sure there are more. 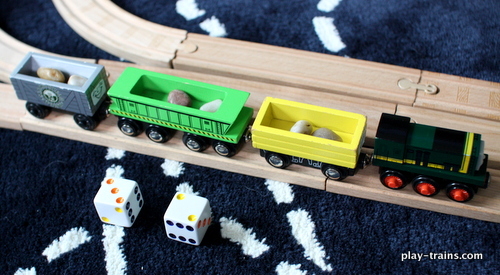 In the first, one die determines the number of cars, and the other determines the number of pieces of freight to load into them. Here, there are three cars, and two pieces of freight, so one car is left empty. This is a good one for comparing two numbers, or for beginning to learn about division. If you’re using the freight containers that fit the cars, and your engineer rolls a higher number for freight than for cars, you can note how not all the freight containers will fit because there are fewer cars than containers. The second variation connects to multiplication. Have the first die decide the number of cars, and the second die determine how many pieces of freight to put in each of the cars. Three cars, with two pieces of freight in each one. 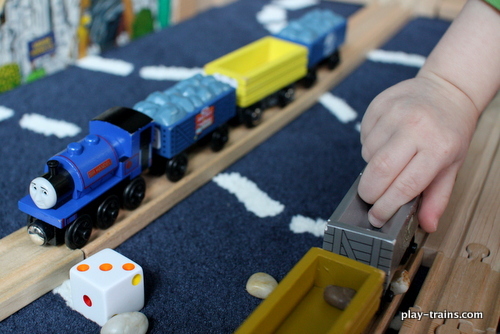 The engineer can then count the total pieces of freight. No, I don’t see us running out of new ideas for Dice Cars any time soon, but let me know if you come up with a good one of your own. We’d love to play it! Wonderful idea! 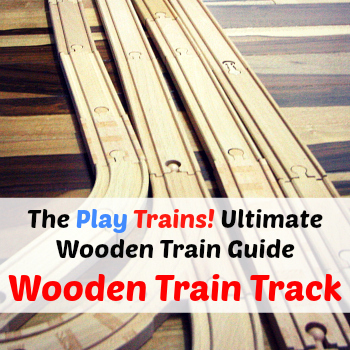 My boys LOVE trains, so we’ll try this game out! Thanks!! Enjoy it! Thanks for stopping by. Great! I hope you and your kids enjoy it. Who doesn’t love dice, right? What a wonderful game and way to teach using what he loves. Thank you for sharing on Sharing Saturday! 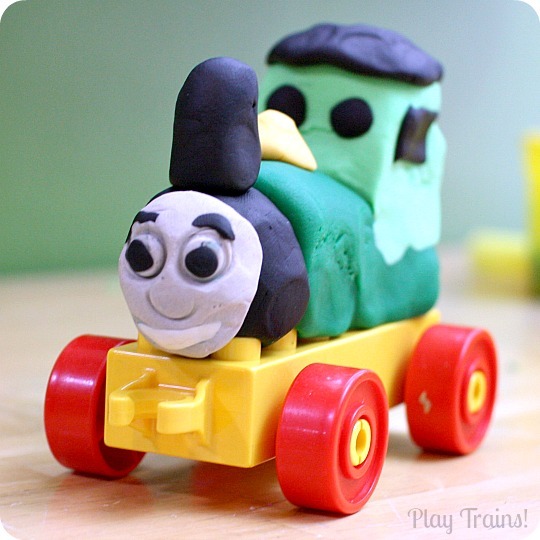 Math and trains! Love it! My son is also very fond of dice. We will need to play this game soon. Great! It’s a fun one.